family a couple of years ago as a birthday gift. peonies, The peonies in this bouquet are the last peonies of the season. They don't last very long, but what a joy they bring to my heart. mother's plants I transplanted in my yard in 2012 after her passing. in California starting in the fall. Shall we celebrate with a cup of tea? Yippiee. our second granddaughter is planning her wedding. Now, remember today is only June 13th. I still have more exciting news. 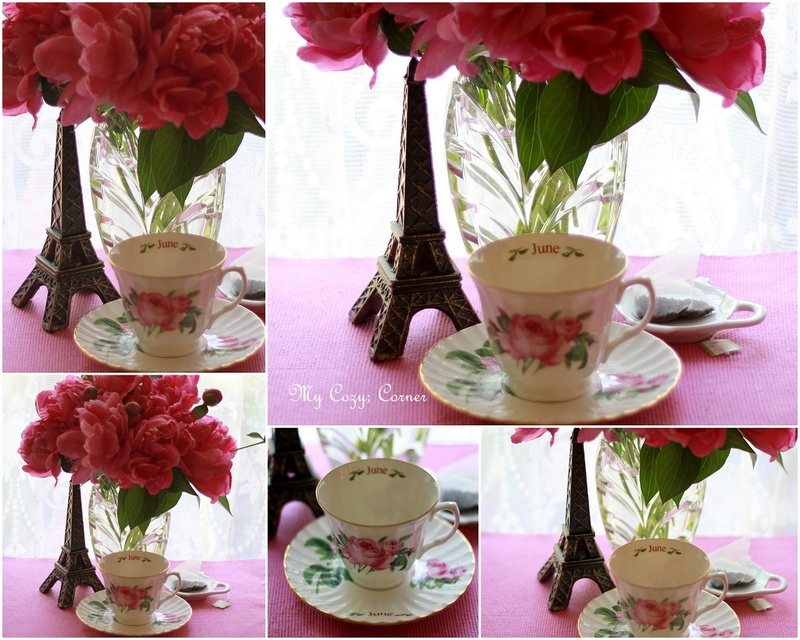 Do you see the Eiffel Tower next to the teacup? Well, I am going to Paris for a week on vacation. to experience Paris in all its glory. and move forward. I am truly blessed. I have six months finished for my 2019 calendar. the whirlwind of activities I enjoyed. I will keep you posted on Instagram.